Couplings, Clutches, Cams, Brakes, Universal Joints - Nordex , Inc.
Used in applications where there is a need to compensate for misalignment, maintain constant velocity, and provide axial compliance. These coupling are ideal for power transmission applications such as stepper motors and servo motors in motion control systems. Flexing Couplings can also be used in precision applications such as those involving encoders and tachogenerators. Nordex’ flexible shaft couplings are available in two styles. 6 Beam Couplings when flexibility is needed and 3 Beam Couplings for more torsionally rigid requirements. Both styles offer no backlash and are reversible. 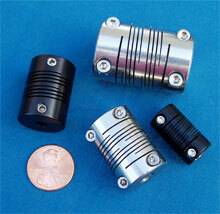 These Flexible Couplings are available in stainless steel and aluminum with a set screw hub or clamp hub. Offered in both empirical (inch) and metric sizes. Special bore combinations and plastic materials available on request. Nordex flexible shaft couplings will readily accommodate any combination of axial motion, angular and parallel misalignment. Nordex One Way Clutches are stainless steel with oil impregnated bronze bearings. 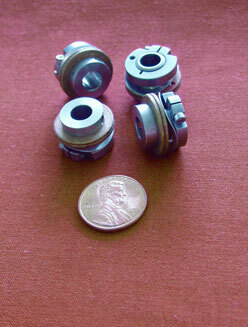 These over running spring, wrapped type, couplings are available for clockwise or counter clockwise direction. Shaft sizes 1/8 to 5/8. Applications include unidirectional stepping, automatic flywheel decoupling and backstopping. Nordex Slip Clutches are Available in three styles. The Spring Wrapped Type is used for continuous duty in tension control and transmission overload protection. The Adjustable Series is used for light duty only – not to be used for continuous duty. This series is for use with hubless gears, chain sprockets, timing belt pulleys and gear blanks. The Miniature Slip Clutch is for adjustable, continuous duty. This series is for use with hubless gears, chain sprockets, timing belt pulleys and gear blanks.